Following a meteor strike, Queen Samara (Jany Clair) has made a deal with some beings who have taken up residence in a nearby mountain, if she keeps sending them sacrifices she will be young, powerful and live forever. This doesn't go over well with the locals who are tired of getting dragged to the mountain in chains and having all their blood sucked out. Luckily, a burly guy by the name of Hercules (Alan Steele) happens to be in the neighborhood and is more than happy to bonk guys with trees and get thrown into death traps, all in the name of helping out. 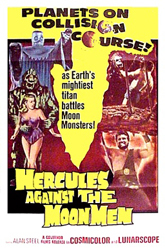 Hercules movies can get pretty weird, and Hercules Against the Moon Men, sets the weird bar pretty high by mixing in a little pulp science-fiction with all the bronzer and loin cloths. 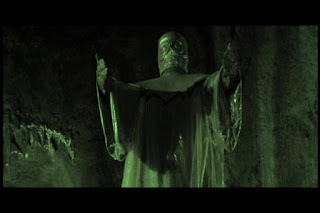 In what is perhaps the only smart move in the entire movie, the Moon Men, giant rock monsters led by a figure in a golden mask, are treated like and other mythological threat. It keeps things from feeling too jarring when you have a demi-god mixing it up with aliens. "Aw, come on. Let me bench press you." The movie has a story with some promise, but squanders it with repeated forays into boring death traps and pointless brawls. I understand that these are stock set-pieces in a Hercules movie, but much like the Santo films, these tedious action moments seem designed to fill out the running time more than entertain. To be fair, there is something enjoyable about watching Hercules razzle a few dozen soldiers with a big dumb grin on his face, but the whole exercise wears itself out pretty quickly. Despite the cruddy print, Hercules Against the Moon Men does offer some interesting sets, and decent effects. The Moon Men themselves are stiff shuffling monstrosities but they are large and imposing. 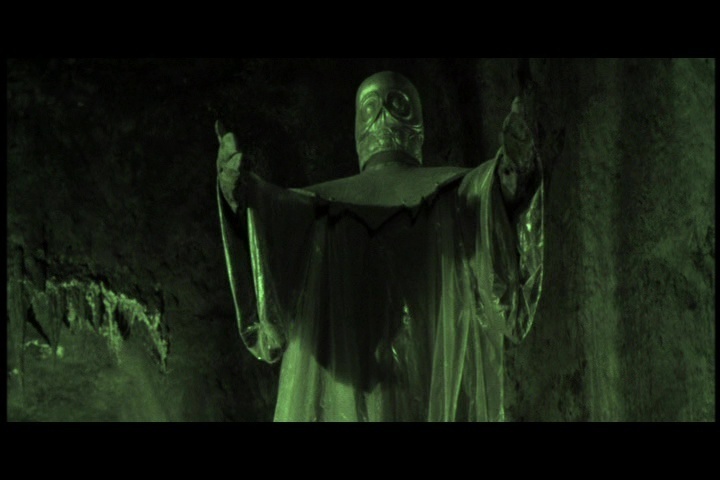 Their gold faced leader has a great costume design and looks quite striking when his evil lair is drenched in green light during the finale. "Careful, or you will find out why they call us the Moon Men." Allen Steele, makes a bland but affable Hercules. He lacks the screen presence that Steve Reeves could muster, but he does appear to be enjoying himself and helps mitigate his non-characterization. Jany Clair, as the evil ruler, steals the movie, even though she is playing a textbook arch-seductress. Hercules Against the Moon Men was introduced to most viewers when it was featured on Mystery Science Theater 3000. Taken on its own the surreal moments take root and you have a film that does on a few scant occasions, manage to conjure up an otherworldly mood. It's not a great monster movie, but it is a mediocre Hercules movie in sea of truly terrible Hercules movies. Faint praise is the best I can offer a movie that is as stiff and lifeless as its rocky antagonists.